"Bleed Me A Melody": Basketball!!! 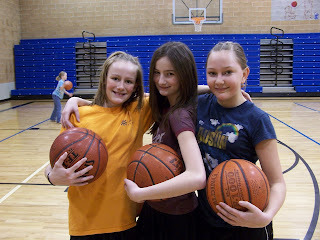 Kenna and I have been doing b-ball!!! We are on a team and we will be playing in tournaments!! I am so excited!! What fun to be playing basketball, and even more fun that you guys are on the same team! You look like you're having fun! I love basketball! You guys are all looking pretty studly. Have some fun! That was so fun too! I can't wait to play in the tournaments in a few days!!! I love you!!!! Now, thems some MUSCLES! Woooo, baby! Hey! Way to go basketball-player-woman-you! 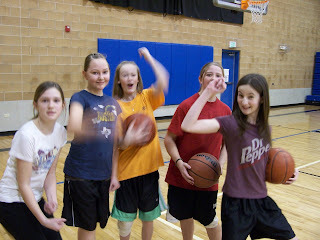 You girls can play ball and still look so dang cute?! How do you do it?! Brooklyn, We like your blog! I like that it's pretty and pink with tan polka-dots. It's very cool having your own blog. It's a fun way for people to get to know you and you can really let your personality shine through. You are such a lovely yong lady. I'm your mom's cousin, but you might alreay know that. It looks like you have a lot of fun with your friends. I'm really glad your mom is ok now. I wish I could come! Me and Kenna from awhile ago!